Peer to peer lending is a unique for many reasons, but one that is often overlooked in my opinion is the cash flow both LendingClub and Prosper accounts provide. As I touched in a recent post about the complaints of peer to peer lending, liquidity is one of the biggest complaints. I offered a counterpoint that the short duration of peer to peer lending investments make them relatively liquid. If you’re wanting to be able to cash out your entire account instantly, peer to peer lending probably isn’t for you – at least for now. I imagine we will see some improvements in liquidity in 2015, but for now – it is slow in, slow out. Unlike other investments, these peer to peer lending loans pay monthly, which means with a portfolio full of hundreds of loans, you are receiving payments daily. To keep these investments earning the most, funds need to be constantly allocated to new loans as payments come in. But life happens and often unexpected expenses or other investment opportunities arise. Peer to peer lending serves an additional purpose in my portfolio as a second emergency fund and stash. If I need funds, I simply turn off the faucet that is automated investing. A few weeks ago I decided that I wanted to pursue another rental property. Since I operate a pretty efficient investment plan due to my steady cash flow – I simply don’t have the funds immediately ready for a down payment. Fortunately, I’m also a planner and my goal is purchase another property early 2015. I’ll also scale back my investing in index funds and decrease my 401k contributions for awhile in 2015. For a relatively small investment in LendingClub (~15k), the funds build up surprisingly fast. But how fast? There are two ways to get an idea of what your cash flow will be on a monthly bases. 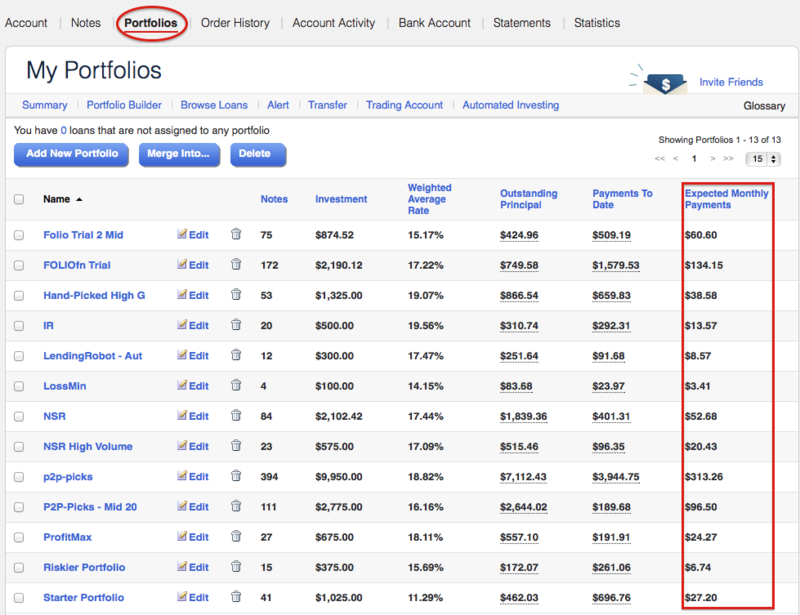 The first way is to simply login to your LendingClub account and click on the “Portfolios” tab. The final column is titled “Expected Monthly Payments” and adding them up gives me an expected monthly payment total of $799.96. However, it is inevitable that some of these loans will not make payments and you are likely to receive less. In addition, payments will decrease over time if you keep withdrawing the payments so this really doesn’t give us an accurate picture of cash flow. Fortunately, the smart folks at LendingRobot have a much more sophisticated cash flow forecast. It includes views for daily, weekly and monthly as shown below. As I noted earlier, you’ll see that LendingRobot estimates my monthly cash flow for December to be around $684 which is likely to be far more accurate than LendingClub. You can clearly see the slow decline of my cash flow if I were to continue to withdrawal all payments. I find these charts extremely beneficial when it comes to planning things out. It’s nice to know that I can plan on having more than $600/month for the next 6 months or so. If you’re looking for cash flow, it’s hard to ignore peer to peer lending. Assuming I’m not reinvesting, I have no other investments where I build up cash every single day and it is able to withdrawal whenever I desire. Perhaps it is time you think differently about the relatively good liquidity peer to peer lending gives you with their short duration loans. As long as you can plan things out, this may also be a good strategy for you. That is a very handy tool for estimating cash flow. Thanks for sharing that and thanks for building it LendingRobot. Well written post. While investments seem “illiquid” – the monthly cashflow is unique when compared to many investments. Bonds pay quarterly (mostly) and stocks (well if dividend also quarterly). 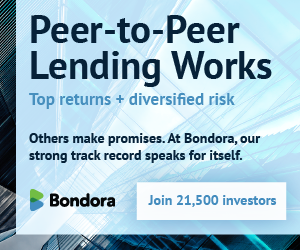 With the percent return, P2P lending or P2B really is unique in its “value proposition” as an investment. We expect expansion of interest as more retail investors join the fray. Very handy and useful tool. I agree P2P lending is absolutely an avenue to consider when it comes to cash flow. Thanks!